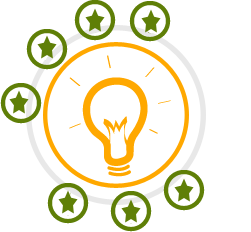 RankZoom Dashboard is designed to allow you to access all of the RankZoom features and benefits from one easy to use location. Quickly navigate to any feature with one click of your mouse. Your Review Analytics are front and center on the Dashboard. You can quickly see where your reviews are coming from and what your customers are saying about you on your Reviews Map. We have developed an easy to use Get Started Wizard that walks you through 4 simple steps so that you can be on the way to collecting reviews from your customers in a matter of moments. 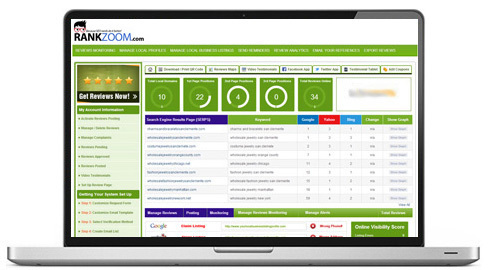 The quicker you collect reviews, the faster RankZoom can start improving your reviews and star ratings online. All of your favorite RankZoom features are available from your Enterprise Class Dashboard. RankZoom's intuitive dashboard puts all of your RankZoom tools at your fingertips. We ease the pain in managing the review process so that you can spend more time growing your business! An easy to use Dashboard lets you build your reviews and star ratings quickly! RankZoom makes it easy for you to collect and market your reviews. We make it easy so you can spend more time growing your business. © 2013 RankZoom All Rights Reserved. GET A LIVE DEMO OF OUR AMAZING SOFTWARE!